After almost a year’s wait, Georgia’s Myway Airlines has finally obtained permission from the Russian aviation authorities to operate flights to Russia. For the young Caucasus country carrier, which is backed by Chinese investors, Russia is a key destination in its bid to improve its financial status. 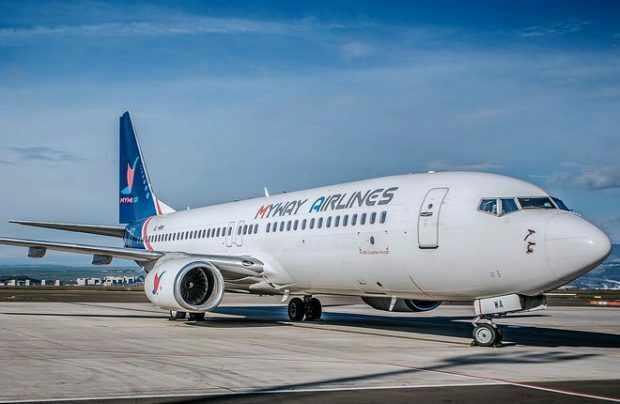 The airline has already announced the April 26 launch of scheduled services between Tbilisi and Moscow’s Zhukovsky Airport (IATA: ZIA). The flights – which directly link the capitals of the two countries – will be operated initially three times a week. A fourth frequency will be added in July. The airline expressed its interest in serving Russian destinations even before it launched operations in March 2018, but its Chinese Hualing Group’s sole ownership status impeded the airline’s attempts to gain the necessary approvals for flights to key markets such as Russia and Germany. To overcome this obstacle, the airline changed its ownership, with Georgian native Igor Aptsiauri now its chief commercial officer having acquired 51 per cent of the airline last October. Along with the delay in obtaining approval for launching flights to Russia, other factors have upset the airline’s business development plans. These have included the declaration of martial law in Ukraine, smaller than originally projected traffic numbers and winter maintenance checks on its fleet of only two Boeing 737-800 aircraft. The depressed situation compelled the airline’s management to suspend all scheduled services, except for the route between Tbilisi and Tel Aviv, in December 2018. Commenting on its new airline customer’s plans, Tomas Vaishvila, general director of Zhukovsky airport operator Ramport Aero, notes that air travel between Georgia and Russia remains a very active market. “Our experience shows that traffic between the two countries is on the rise. So having a second airline on this route in our schedule will give wider travel opportunities for our passengers,” he adds. Myway Airlines competes with compatriot Georgian Airways, formerly named Airzena, as well as several Russian carriers, all of which currently serve the Georgia-Russia market. Zhukovsky Airport is an international airport serving the Russian capital and is located 23 km to the south-east of Moscow.